In our continuing series, here’s reason #11 of why I love the Bible: The Bible inspires us. Though many books can provide daily inspiration, the Bible stands by itself when it comes to its profound impact, a supernatural impact that comes from God. The Bible contains many passages that offer encouragement. Often these come from the many promises the Bible has for us. When we come across one of these promises, we must claim it as our own, to embrace it, except it, and relish it. The promises are many, but often we must search for them. Yes, a few verses say, “…and God promised…” But for most instances we must read more carefully to find the promises God has for us. However, the Bible also offers encouragement in other ways, too. The Bible overflows with God’s love, and this should encourage us. The Bible shows us of God’s repeated deliverance, and that should encourage us, too. And the Bible shows us that we are part of something much greater than ourselves, and this should encourage us even more. The Bible contains many stories about real people who encounter life in both usual and unusual ways. How they react can motivate us to live better and to live right. Take the example of Jacob’s son Joseph in the Old Testament. As a boy, Joseph doesn’t always exercise the best judgment, but as he moves into adulthood his life is worthy of emulation. Through his life, we’re inspired to avoid his youthful mistakes and follow his example of unfailing integrity as an adult. 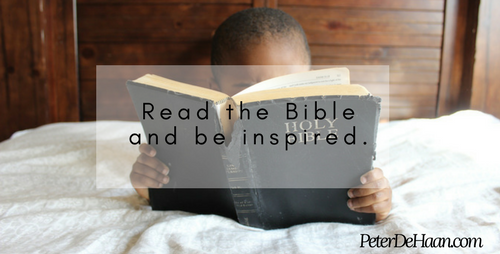 Yes, the Bible inspires us—but only if we read it.